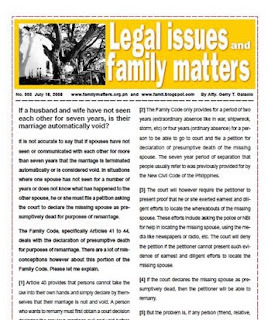 Legal Updates on the Family Code Philippines and relevant matters: If husband and wife have not seen each other for more than seven years, does it mean that their marriage is already void? thank you attorney for your explanation. I've been explaining the same thing to my friends but like what you said, there have been a lot of misinterpretation and misconception of the law spicifically on this matter. i wish they will be able to read your aritcles also. we got married 1999 but never live on the same roof up to this day,i left phils 2000 and never see my husband then,3yrs later i heard the news he got married again.is my marriage with him still valid?and im allowed to sue him for bigamy?he told me its our marriage that is registered in phil nso.how he could remarry another girl in that situation? 1. In the first place, you have to check with the NSO whether you are legally married to your husband or not. Please take note however that the marriage certificate is neither an essential nor a formal requisite of marriage under the Family Code. The existence or validity of a marriage can be proved even if the marriage certificate is not on file with the NSO. 2. Assuming that your marriage is valid and subsisting, then your husband cannot get legally married again. You can thus sue him for bigamy, except if the second marriage took place outside of the Philippines. This is because under our system of laws, a complaint for a crime can only be filed in the place where the crime took place. If the second marriage took place outside the country, there is a question as to where in the Philippines can you file the case for bigamy. Please read my article “Adultery, concubinage and psychological violence” http://famli.blogspot.com/2006/01/adultery-concubinage-and-psychological.html . Instead of bigamy, you can file a case of psychological violence against your husband, assuming that he committed acts that injured you psychologically after March 2004, the time when RA 9262 took effect. 1. Are you the same person who posted the following comment in my article on marriage? First of all, please refrain from using any foul language like “”bullshitting” in my blog. Secondly, please understand that, besides other commitments, I have three websites and five other blogs I maintain. I have no other person helping me out in this endeavor and I cannot therefore answer all legal inquiries immediately. 2. Please clarify certain matters. Are you saying that you and your husband got married in Canada and then your husband subsequently got married again here in the Philippines? [A] You can retain the services of a private lawyer who will draft the complaint-affidavit for you. This complaint-affidavit will then have to be signed by you in the presence of the fiscal, and then filed with the Office of the City Prosecutor (of the place where the crime of bigamy or more precisely, where the second marriage took place). [B] You can go to the nearest police station and look for the officer in charge of the Women and Children’s Desk. You can give your statement there and the police will endorse the records - complaint, statements of witnesses, other documents you submit - to the Office of the City Prosecutor (of the place where the crime of bigamy or more precisely, where the second marriage took place). [C] Bigamy is a public crime under Philippine law, and so, anybody with knowledge of the crime and who can prove it by pertinent documents can file the case here in the Philippines. If you have relatives here in the Philippines, then you can provide them with the necessary documents and they can file the case for you. If the second (or any subsequent marriage for that matter) took place outside the Philippines, then there is a problem as to the venue or place where the complaint should be filed. Under the Philippine system of laws, venue is jurisdictional. This means that the complaint for a crime must be filed in the place where the crime took place. If the bigamous marriage took place outside the Philippines, then there is a problem as to where in the Philippines the complaint can be filed. atty i would like to know what if the husband wants to file a legal separation is out of the country? Right now he is out status in that country. Can he still file a legal separation? How? After your husband signs the petition in the presence of Philippine embassy or consular officials, he will then send it back to his lawyer. 3. Since the Rule provides that the petition must be filed in the place where the petitioner has at least six months residence (and your husband is abroad), most probably your husband’s lawyer will file it in your place of residence. 4. For the pre-trial conference and the hearings however, your husband must be here in the Philippines to attend the hearings. A filipino residing in U.S as immigrant went back to Philippines to marry a filipina girlfriend in 1989. Upon returning to U.S., he discovered that she had an on going affair to a married man. Filipino in the U.S.divorced the wife in 1990 and later remarried in U.S. in 1992. In 1995, Filipino became naturalized U.S. citizen. Now,2008, The man wants to go back and retire in the Philippines with his new family and already re acquired Filipino citizenship by dual citizenship RA 9225. Will he have any problem with his situation. Can the first wife force him for support under RA 9262? Can he be charge with any crime? The issue is complicated for several reasons. The divorce in 1990 is not recognized here in the Philippines, that is certain. However, the subsequent naturalization of the Filipino means that the Family Code no longer applies to him. The effect of dual citizenship further complicates the matter since it is a gray area as to what law will apply for example in terms of divorce (the FC does not recognize it under Article 26 but American law allows divorce for its citizens). This issue can only be clarified in an actual case filed in court and decided ultimately by the Supreme Court. Thanks for your response. Will it make a difference if the man enter the philippines using only his U.S. passport and not reveal his dual citizenship? I wish I can give you a solid assurance that nothing untoward will happen or that you will be protected from whatever legal actions your first wife may file against you. But I cannot guarantee or give you any assurance that your US citizenship will protect you once you are here. gud eve atty,we got maried 1994 but we are separated 4 almost 12 years.i just want to know if our marriage po b is still valid?upon cheking po kc sa NSO we a have a marriage record. Despite the separation of 12 years, your marriage is still valid. Even if there is no record with the NSO, the marriage is till considered valid since the marriage certificate or contract is not an essential or formal requisite of marriage under the Family Code. mraming salamat po atty.but i have 1 more ques.kc po my husband is living together with his live in partner & they have 2 kids n.i dont know po how long n cla ngsasama?at ako po ay isa anak sa japanese,but we are also separated last july dis year.sa ngaun po may comunication n po uli kmi ng husband ko by txting & sumtyms we talk po personaly.& nalaman ko nga po ayon din po sa mga sinabi nya skin na gusto n daw po nya iwan or hiwalayan ung live in partner bcoz of hindi cla mgkasundo ng dahil n rin sa ugali nung babae.if ever po b atty may habol po b ung live in partner nya sa asawa ko if ever n hiwalayan nya?pwede pa po ba uli kmi mgsama ng husband ko? Yes, you can reconcile with your husband. The problem is however, the other woman can possibly file RA 9262 cases (civil, criminal, Protection Order) against your husband. Please read my RA 9262 posts (look for the links in the sidebar). What your husband should do is to separate peacefully with the other woman by providing for all the financial support for the woman and the kids. is that fair po b or nasa batas ntin n mgprovide ng financial suport my husband 4 d woman & kids if ever n hiwalayan nya?db po nbanggit ko po sa inyo n separated n po kmi 12 years?we have 2 kids din po atty.but since we separate until now wla po kmi nakuha or wala po cia bnigay financial suport smin mag iina?i understand nmn po his situation n hndi nya kmi nsurportahan financialy sa rison n hndi nya kaya?dats why ngsikap po ako mg work abroad at dun ko po knuha binuhay ko sa mga anak nmin.my ques.is sino po ba ang mas may higit n karapatan smin ng knkasama nya?hindi nmn po kc gnun kalaki sinusweldo ng husband ko 2 suport 2 family if ever.. Please read my post in this blog titled “Financial support for abandoned woman and family” (look for the links in the sidebar). The amount of support will depend on your family’s needs AND the capacity of your husband as determined by the Family Court. 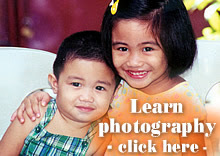 You can also avail of the benefits of our Solo Parents Welfare Code by coordinating with the DSWD in your town or city. mraming salamt po atty.more power to you & god bless! ask ko lng po f pwedeng hndi ko bgyan ng finacial suport ung dati kong aswa dhial sa myron n itong bgong knkasama aqt my anak ndn po sila..ngunit ako din po ay my anak dn sknya.nung una po kc n ngbbgay ako cnsv ng anak ko n bnbgyan daw ung lalaki nya at ung nging anak nila. ano po b dapat kong gwin?? 1. Since you are in fact separated from your wife, you should at the very least file a petition for separation of property and take steps to disinherit her. These two issues are taken up if you file a petition for legal separation under Articles 55 to 67 of the Family Code. 2. If your child is old enough, you can open an ATM bank account for him/her, and you can place your support into that account. It is true that, as your lawyer told you, since you are outside of the Philippines, our courts do not have jurisdiction over you. But your husband can possibly create problems for you like reporting to the Australian government that you lied in your application (that is you are married and not single). One possible option for you is to acquire Australian citizenship and then later on file for divorce under Australian laws. may tatanung lan po ako. may bf po ako married po siya pero hiwalay na po sila mga dec 2007. ang dahilan po nag kanilang pag hihiwalay. nawala ng apat na araw ang asawa ng bf mo at sumama sa ibang lalaki..kaya lang da niya tio nagawa dahil sa pagiging babaero nito at sa mga ibang bagay pang problema ng mag asawa..
nung una sa pasig naninirahan ang bf ko dhil malapit ito sa kanyang trabaho. kahit hindi na sila nagsasama sa isang bahay nag kikita at may ng yayari pa sa kanila sa tuwing nag pupunta ang asawa niya. nang umuwi na ang bf ko sa bahay ng magulang niya sa cavite, hindi na po sila nagkikita pero matuloy pa rin po ang pag bigay nito ng sustento hindi nga lang regular ang pag bibigay gawa na rin sa sahod nito. ilang buwan pa tuloyan ng hindi naka pag bigay ng sustento ang bf ko dahil nagkasakit ito na Hepa B.
Nang muling naka balik ito sa trabaho niya may naka pag sabi na may kinakasama ng iba ang asawa nito. ang dahilan ng kanyang asawa wala bubuhay sa kanila mag-iina. At dun naman po nag simula ang relasyon namin. maari po bang ma-void ang kasal nila. at kung sakali po na kame ay mag sama ng bf ko may pwde po bang ako makasohan at ang bf ko. at maari po ba ilagay ng bf ko sa mga documents niya na siya ay seperated na kahit ndi pa annul yung kasal nla..
tulad sa sss, phil health, BIR, pag-ibig. dahila nag aayos po siya ng mga requirement niya sa trabaho..
atty. follow up question lang po maari nya po bang declare na single siya sa mga documents nya at ilalagay nya na beneficairy ang mda anak nya..hindi po ba ito magkakaroon ng problema in the near future.. I need some advice atty. wala po kasi lahat ng mga documents namin mag asawa.kasama ang marriage contract namin. kumukuha ako ng copy sa NSO pero wala silang copy sa NSO at Ganun din sa city hall. saan pa po kame maari mag punta para makakuha ng copy. and one more thing atty. posibling bang hindi valid ang kasal namin. 1. How, where and when exactly did you get married? 2. The marriage contract or certificate is not an essential or formal requisite of marriage under the Family Code. Even if it is missing or not on file with the Local Civil Registrar or the NSO, it does not mean that your marriage is not valid. The validity of the marriage can still be proven by the marriage license, the testimonies of the solemnizing officer, witnesses, wedding pictures, etc. He can be charged criminally with perjury (lying under oath) if he does that. i would like to inquire about something, i was married Feb of 2001 and i got 18 November of 2000. After my marriage, it is just like a whirlwind relationship. We're not staying in the same roof and had an on and off relationship. right now I'm working outside our country. i'm the only one who's supporting for our kid's education and necessities, no financial support from him since 2004. We haven't talk nor see eachother after December of 2007. I really want to let go of this marriage but i don't know what to do... Please advice and help me. many thanks. Please read my posts (1) Amy Perez case: Psychological incapacity in annulment of marriages; (2) Sexual infidelity or promiscuity does not constitute psychological incapacity; and (3) Irreconcilable differences not a ground for declaring a marriage null and void. Look for the links in the sidebar. 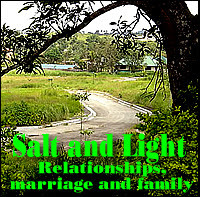 Please also read my Salt and Light blog post “Biblical grounds for divorce and remarriage”. hi atty. tnung ko lang po seperated na po ako sa wife ko pero hindi po legally seperated. May asawa na po ito ngayon at buntis po siya may dlawang anak po ako sa kanya..
mag aaral na po kasi yung panganay ko kinder na sa pasukan..
dapat pa din po ba na ako lahat mag shoulder ng gatos nila.. Minimum lang po kasi ang sahod ko..wala naman po kasi trabaho yungex-wife ko at yung bago niyang asawa ay extra extra lang..imbes na para sa anak ko mapupunta pa sa kinkasama ng asawa ko lalo na po ngayon pag na nganak na po ex-wife ko.. Articles 194 to 208 of the Family Code are the laws on support. The amount of support is balanced by the court between the needs of the person asking for support and the financial capability of the person from whom the support is being asked. Your ex-wife has to help support the education of your child. gud pm atty. tanong ko lng poh. Me and my ex wife separated 2003. since then di n kme ngssama ang huling blita ko s knya nangibang-bansa n sya, and now meron akong nakilala at nkarelasyon at gusto ko na syang mpaksalan. anu poh bnga pwede kong gwen pra ma-void or ma-annulled ung kasal kos ex wife ko? As I discussed in this post, the separation between the spouses even beyond seven years does NOT invalidate the marriage. What you can do is to file a petition for declaration of nullity of your marriage based on Article 36 of the Family Code, for example. As to obtaining support for your kids, please read my post “Support for abandoned woman and family” (look for the link in the sidebar). What if i was made believe that the marriage would fake and only be needed for formality? My ex girlfriend’s family fooled me. I was just 23 that time and i didn’t know anything about it. What shall i do to make it void? You were 23 (five years above 18, the age of majority) when the alleged fake marriage took place. With witnesses, the testimony of the solemnizing officer, the documents (license, etc), it will very difficult if not impossible to convince a judge that that it was all just a sham or make-believe. If our courts accept your kind of claim, then anyone can have their marriage declared null and void by simply claiming that their marriage was just make-believe. my cousin has been abandoned by her husband 9 years ago. they have two children whom the mother is supporting. what should my cousin do in terms of changing her SSS beneficiaries because she would like to cancel her husband's name as one of her SSS beneficiaries. Your cousin should inquire with the SSS as to what its policies are. Your cousin can also ask a very competent notary-public to prepare a document for disinheriting her husband. She should also file a petition for judicial separation of property. In a petition for legal separation, these issues of disinheritance and separation of property are taken up. good day atty! and thank you for this very informative blog of yours. my wife and I were married on 2001, and up to now there is no record on NSO. the original copy although is on my possession. we separated in 2004, she left for the middle east and never come home. we have a daughter now 7yrs old. i took care of our child with the help of her parents from the day she left until july of 2005 when i went to japan. now, im coming back home in 2010, and i want custody of our child. the child is now being taken care of the parents of my wife. the child doesnt know until now that her parents are separted. and i have some humors that my wife is now married with an arab. i want the full custody of the child, what shall i do when i go back home in march of 2010? can i force our child to live with me, because i think my daughter is being brainwashed by my in-laws and her relatives not to go with me when i go back home. what shall i do with our marriage? i know its not void. re-marrying another party is not on my mind right now, i really like to have our child. and can i sue her for adultery and marrying again? 1. Your marriage is not void simply because there is no record of the marriage contract or certificate with the NSO. The marriage contract or certificate is NOT an essential or a formal requisite under the Family Code. 2. If the adultery and remarriage of your wife took place outside of the Philippines, it will be a problem in filing a criminal case here. In our system of laws, the criminal complaint must be filed in the place where the crime took place. For example, if the crime took place in Quezon City, it cannot be filed in Manila. (The question of venue or where the trial hearings can take place is a different question, as in the Maguindanao massacre case.) But you do have options of filing a civil case for damages against your wife. 3. The Family Code provides that a child above seven can choose which parent to live with. If the parent chosen is unfit, the court can intervene. The issue is between you and your wife; your in-laws do not have any say in the matter of custody. Please read my post “Custody battles over children between grandparents and a father or mother” (look for the link in the sidebar). 4. You have to decide what to do with your marriage. Your options are legal separation, annulment of a voidable marriage or declaration of nullity under Article 36. Please read the “Frequently Asked Questions” section of my website www.familymatters.org.ph (together with any of these options, you can ask the court to terminate your wife’s parental authority). You also have the option of simply filing a petition for the termination of your wife’s parental authority over your child and for full custody to be awarded to you. atty; m mae ngsma kme ng husband ko 2002 then ngpksal kme 2006 then 2007 ngpunta cya ng italy kc andun parents nya, bcoz he didnt support me financialy ngpunta ako bangkok pra magwork then sept sbi nya if nde cya ngkakapapel uuwi n cya s pinas at if ngkkpapel ay kukunin n nya ako help ko lng cya s financial, ok nmn po usapan nmin then 1 day my fren daw cya nkakita sken n my ksma ako iba db yes its my fren then call husband ko then nliwanagan nmn after few days nde n cya ngpramdam,nlilito ako tumatwag ako o txt nde n cya nsgot pra alam ko po sna kung anu situation nmn, until now then ngsearch ako s facebook then nkita ko cya my ksma n dun at in a relation n cla ng girl oct 6 2009 nkasulat dun,i called n confront him, nde nkakaimik, mlaki po b lban ko if ever n mgfile ako against him s economic abuse at psycholocgical kc po nccra n work ko dhil dun,, icant concentrate anymore,, mggwan po bng mpauwi cya? gsto ko n po sna cya mpauwi dito sa pinas tutal wla nmn cya paper dun s italy,, please help me atty. nlilito n po ako at nde ko alam ang gagawin.. i sent email po sa inyo.. this is not the first time n nambabae cya pero this is the first time n kinalimutan n nya ako dhil s babae.. please help me.. I have sought for an annulment of marriage since my ex and i got married when we were 18 without parental consent and we never lived together after that. however, i only filed the annulment case after 15 years. My petition on this ground was denied because it should have been filed ten years ago since the family code has a five year prescription period. Is there a way to go around this? We did not live together. Can article 68 be a basis to solidify this ground since we never lived together and so never have actually been husband and wife? Btw, we do not have any children. We just broke up 2 months after and never assumed that we got married. Article 45 of the Family Code states that a marriage where there is lack of parental consent is voidable (meaning, valid until annulled). The said article however provides that if, after attaining the age of twenty-one, such party (who lacked parental consent) freely cohabited with the other party and both lived together as husband and wife, the marriage is deemed ratified. Article 47 provides that the action or petition to have the marriage annulled can be made by the party whose parent or guardian did not give his or her consent, within five years after attaining the age of twenty-one, OR by the parent or guardian or person having legal charge of the minor, at any time before such party has reached the age of twenty-one. Since your parents did not file the petition for annulment before you reached 21 AND you yourself did not file the petition five years AFTER your reached 21, the court as therefore right in dismissing your case. Article 68 has no relevance in your current petition. You can of course file a petition for declaration of nullity of your marriage no longer on the basis of lack of parental consent but on Article 36 (psychological incapacity).